Fancy something a bit creepy but firmly set in the real world without any supernatural shenanigans? 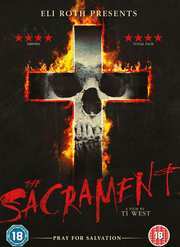 Then the House label has a new chiller coming out on DVD this 7th July, entitled The Sacrament. Written and directed by Ti West and produced by Eli Roth, this stars Joe Swanberg, AJ Bowen and Kentucker Audley. With a runtime of 100 minutes and a 15 certificate, expect a recommended retail price of around £13.99. This follows two ill-fated Vice Media correspondents as they set out to document their friend’s journey to find his missing sister. Travelling outside of the United States to an undisclosed location, they are welcomed into the world of remote commune “Eden Parish,” a self-sustained rural utopia, comprised of nearly two hundred members.